The JC Tackleway narrowly missed out on winning a county knockout football competition last night (Tuesday). 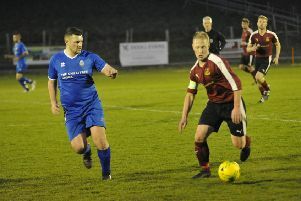 The East Sussex League Division One outfit lost 2-1 against Rudgwick in the Sussex Bluefin Junior Challenge Cup final having led until midway through the second half. The heavy showers cleared just in time for the start of what proved an entertaining game for all the travelling spectators at the Sussex County FA headquarters in Lancing. Both teams set off at a fast pace, which didn’t really relent throughout. Rudgwick adapted to the 3G surface almost immediately and gave Tackleway some early scares, but Dan Bone and Andrew Olerenshaw held firm in the centre of Tackleway’s defence. Tackleway gradually settled, and the long ball to the chasing Toby Payne and Kale Williams caused a few anxious problems for Rudgwick. But it was a short passing move which led to them opening the scoring in the 35th minute. Payne cut inside and smashed a 25-yard effort which the goalkeeper was unable to hold. The second half started similarly to the first, with the West Sussex outfit keeping the ball for long spells and putting a lot of pressure on Tackleway. Only the acrobatics of goalkeeper Luke Caister kept Rudgwick out, yet Tackleway had a great chance to double their lead which they were unable to convert. Midway through the second half, Rudgwick got their reward. Tackleway failed to clear a loose ball and the Rudgwick striker pounced to slip the ball into to net. This fired Rudgwick up and 10 minutes later their winger cut in from the left to fire a shot into the bottom left-hand corner for what proved to be the winner. With time running out, Tackleway changed formation and pushed for an equaliser, but there just weren’t enough minutes available and Rudgwick’s resolute defence earned them victory.